Fitbit is a newcomer to the smartwatch game but it is already giving the likes of Apple and Samsung a run for their money. Its Versa has been a best seller since its launch early last year, helping the San Francisco outfit capture a 12% share of the market. Samsung, on the other hand, has been churning out great smartwatches for a few years now. Its latest effort on this front is the Galaxy Watch Active, the successor to Gear Sport. 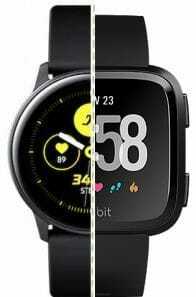 Both the Galaxy Watch Active and Fitbit Versa are fitness focussed devices that bring a lot to the table. If you’re on the fence on which one to opt for, here’s how they compare. Versa is a great looking watch, much better than Fitbit’s first effort on this front – the Ionic. The device is made of lightweight 6000 series aerospace-grade aluminium and comes with stylish rounded edges. There are three physical buttons on the sides, one on the left and two on the right. Users can use these along with the touch-screen, to navigate their way through the menus. After a bit of practice, you’ll learn how to whizz through the different screens. The actual dimensions of the device are 39.36 x 37.65 x 11.2mm. It comes in a number of different colours including Black (with black band), Rose Gold (with peach band) and Silver (with grey band). The straps are interchangeable so you can tailor everything to your mood and occasion. Samsung Galaxy Watch Active measures 40mm, 39.5 x 39.5 x 10.5mm (H x W x D) so is not all to different from Versa when it comes to size. Nevertheless, with its circular design it comes across more like a traditional watch. The thing weights only 25 grams so is lighter than the Fitbit (38 grams). A company spokesperson said the Samsung watch weighs the same as a single strawberry! Watch Active is available in four colours, including Silver, Black, Green and Rose Gold one. The trademark bezel is now a thing of the past so users need to navigate their way around via the touchscreen and two physical buttons on the right. Both watches come with quality displays. Versa with a 300 by 300 pixel LCD touchscreen with a screen real-estate of 1.34 inches. Samsung a gorgeous 1.1 inch Super AMOLED display with 360 x 360 pixel resolution. Versa’s screen is off by default and springs to life when you tap on the display, press a button or lift your wrist. Watch Active, on the other hand, has always-on display support. In terms of design, neither of these devices disappoints. If you are after a more traditional looking timepiece, Watch Active with its circular design is the obvious choice. Versa does have a bit more screen real-estate which makes reading everything slightly easier. Under the hood the smartwatches share a 3-axis accelerometer, 3-axis gyroscope, optical heart rate monitor, altimeter/barometer and ambient light sensor. They also come with on-board music storage and NFC for contactless payments. An important difference is the inclusion of built-in GPS on Watch Active. Versa only has Connected GPS which means it latches onto your smartphone for a signal. For serious runners this might be an important distinction. On to battery life. With each passing year this is improving. Fitbit has never had a problem on this front and Versa is no different from its predecessors. It will keep going around 4-5 days on a single charge. Not bad. Owners of the Samsung Galaxy Watch, on the other hand, will struggle to get past the two day mark. They’ll need to use the QI wireless charger quite often to top up the 236mAh battery. If you want a Samsung watch with more juice, Galaxy Watch is the one to go for. Water-resistance is good, though, on both devices. Versa and Watch Active sport a a fantastic 5 ATM rating and will monitor your swim sessions with appropriate statistics. Needless to say, both of these watches are quite good when it comes to fitness tracking. We’ve come to expect that from the two tech giants. An average user will find pretty much everything they need for monitoring their activity 24/7. They’ll get info on steps, distance travelled, active minutes, calories burned, activity and sleep. There are also move reminders and some advanced performance metrics such as VO2 Max. As mentioned, an obvious advantage of Galaxy Watch Active is the built-in GPS. Along with storage for music, this allows for phone-free exercise. The other fitness benefit of Watch Active is its ability to keep an eye on stress levels. The wearable will give you an alert to rest if it sees a spike in your heart rate which cannot be attributed to exercise. Similar to Fitbit’s Guided Breathing Sessions, you can then use Samsung’s breathing exercises to chill. Finally, Watch Active has an experimental blood pressure monitoring feature. It comes from an optional research app users can install that has been developed jointly with the University of California, San Francisco. You can read more about it on this link. The short battery life is however a hindrance for something that is supposed to monitor your activity 24/7. Versa does not have this problem. Fitbit’s device also comes with a simple user interface and great health/fitness tracking. After all, this is what the company is known for. So while the Samsung Health fitness tracking platform is a solid option, it comes nowhere near to what Fitbit offers. Versa also comes with more in-depth activity and sleep tracking, on-screen workouts, and even a Female Health Tracking feature. This allows women to see how their periods impact different aspects of their lives, everything from sleep to activity levels. When it comes to non-fitness features, it’s clear as day that both of these devices are playing catch-up to the Apple Watch. But Samsung is closer. Watch Active uses the Tizen OS. This allows for seamless handling of notifications, plus you can respond to messages using your voice or on-screen keyboard. The app selection is also steadily growing. Furthermore, the Samsung device comes with built-in storage for music has an NFC chip which stores credit card information so you can leave your wallet behind. Versa with its FitbitOS doesn’t feel as polished on this front although it does come with music storage and Fitbit Pay. There is also an app store with a handful of native apps and an open its SDK for third-party developers. Choosing a winner between these two is not easy. But rest assured, you won’t go wrong with either of them. Having said this, Fitbit Versa is probably the better choice if you’re looking for the ultimate fitness companion. It comes much longer battery life, a simpler user interface, a better fitness tracking experience and a slightly lower price. Galaxy Watch Active, on the other hand, is the better all-rounder offering a combination of great smart features and solid health-tracking. It comes with stress tracking, the experimental blood pressure measurements and built-in GPS. Also, if you prefer your wearable to look more like a traditional watch, this is the one to go for. As a budget-friendly fitness device, Versa is a great option. You can also shave a bit more off the price if you opt for the Lite version. If, however, you are equally interested in non-fitness features and can make use of the built-in GPS, Watch Active might pique your interest.